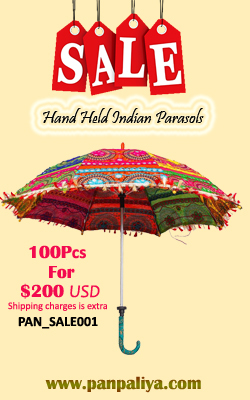 Welcome to the world of Panpaliya, Jaipur for the latest and finest in Barmer Hand Embroidery products. Combining the finest of Indian handicraft skills with the best quality materials, the product line of Panpaliya boasts of products which really deliver the punch for you and become the automatic choice of millions going into the next millennium. The designs and color, range from aggressive to mellow, catering to everybody's choice and at the most competitive prices. A Panpaliya product will make the user rediscover the pleasure of beauty, elegance, grace and glow in the enjoyment of using a product made to perfection. R & D is the watchword at Panpaliya where all facets of a product are researched and integrated to blend into a product that is the last word in fashion, quality, design and protection. Fashion, which marks the passage of an epoch that sees unusual mixtures of work forms like hand embroidery, Patchwork, Beadwork, Printing, mirror work and tiedye which transit futuristic atmospheres. Panpaliya products walk the line between the glamour of 20s and a new space odyssey with appealing creations varying from arrogance to the seductive. Design is a specialty with the house of Panpaliya. From the floral designs of the comeback of romanticism with a really lyrical air, to the simple elegance for the small prestigious creation, the Panpaliya Bedspreads, Cushion Covers, Bags and Decoratives combine the need for practicality with sophistication and exude a luminosity that "makes fashion". Exquisite embroidery and sequins enhance the models with patchwork effect. Panpaliya bags, whether with a linear design and an evergreen shade for an urban model, or the topical metropolitan tone for the roomy city shoulder bag or the small and seductive shoulder bag or the one with a classy contour for a refined shoulder bag, they all stand apart as models for impeccable workmanship. Interpreted in natural vegetable elements tending towards shine and the essential proportions of the new millennium.